On Whitsunday is the 150th anniversary of the day on which the settlers of this community reached their long desired destination. It was a long and difficult 7 week trip. 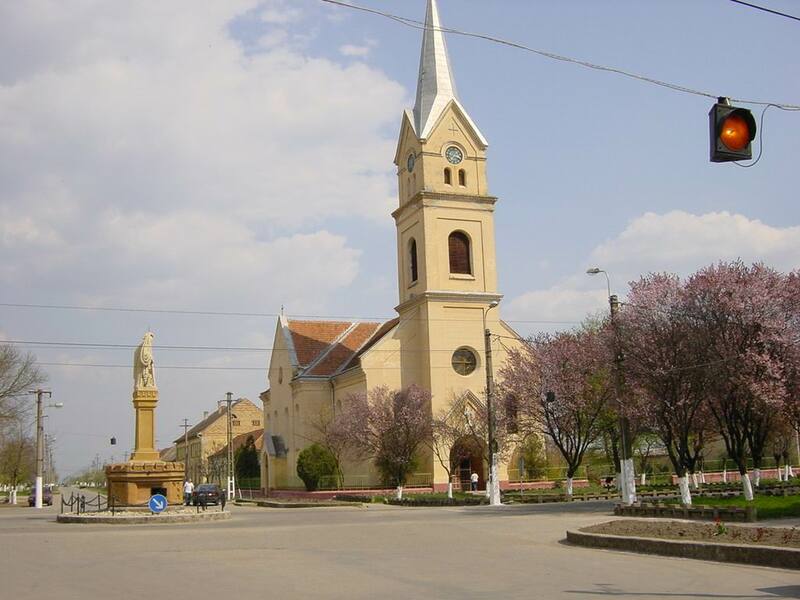 On June 11th, 1766 Johann Wilhelm von Hildebrand reported to the state administration in Temesvar that Pastor Sebastian Plenkner had arrived with his German settler families. For us, the decendents, the 100th memorial day in 1866 could not be celebrated openely due to the war against Italy and Prussia. Today our situation is even more oppresive than then because so many of our relatives have been out in the field (war) for the last 22 months to insure a better future for us, while we at home can hardly manage the economic difficulty that war brings. Even if we have to forgo this years celebration we will not let the occaision pass without thinking of our forfathers and their willingness to work hard. With this, they laid the foundation of the wealth of our community today. From the following story we can learn how, and with what unbelievable difficulty the settlement was done. Faith, courage and a willingness to work hard made us overcome obstacles. After 100 years and many deaths people have finally adapted to the climate of the NEW homeland as health now is mostly satisfactory. The older folks can tell us about the big changes that have come with time. When they talk about the "good old days" we should not take it literally for when the old folks look back they only see their own youth in a rosy light and the hopes of todays young people as a delusionary deception. This anniversary will be a welcome occaision to look at the past and present and discuss a better future, so that we may make more and more revenue from new development. In spite of all the private wealth, the community has stayed poor. We must create new jobs and possibilities for those willing to work or we will lose them to other places, or worse yet, America. The fact is over 1000 already find work outside of this community. Industry is offering unmeasurable sources of employment and the railroad makes it easy to deliver thousand of shingles to Siebenburgen and Bulgaria. The work force is our most precious treasure. We must be amazed at the forsight of Queen Maria Theresia and her government. they spent 7 million Gulden to populate the Banatan marsh with German settlers, and replace Schlesien which was lost in the war. Reimbursement has been hundredfold through Banat taxes and will be thousandfold in the future. The old saying holds true, "if you want to harvest you must also sow". It will stay that way in the future, but only if we know and speak the Hungarian language so we must teach it to our young. Our grandparents attempted this when in 1858 we sent 12 children to Zenta to learn Hungarian but was soon forgotten after their return home. When people speak their mind here it is in Schwobish, but we must not forget the high German language as it will be important for trade and commerce in the future. Seven years ago the most beautiful landmark in the village, the Kalvarienberg (cemetary hill landmark) had to be leveled to make way for the train station. Unfortunately there is no picture of it anywhere. Thats why I made a sketch of it from my memory for the front of this program. My parents house was across from it at the time I started school and it was my favorite playground. Before and after the war of 1756-63, King Friedrich the Great of Prussia, Queen Katharina of Russia and our own Queen Maria Theresia competed to re-populate sparsly populated areas. The main recruitment area was the overpopulated and war weary area of the Rhine where farmers suffered high taxation. Since 1718 small and large groups did arrive in the Banat, via Vienna, but many died off due to fever. Thats why the Banat was called the "Grave of the Germans" for most of the 1700's. Until 1766 only the high land was settled and lowland (swamps) used in dry season for hay growing. Only after the Dutch Dam builder Max Fremont drained the Bega & Temeskanael areas from 1759-1760 could the area be considered for settlement by the Banat state government. Johann Wilhelm von Hildebrand had two jobs. He was the Administrater and in charge of the settlements. To assist him he had District Administrater Franz Josef Knoll (St. Andras), Comptroller Andreas Laff (Esenad) and Josef Neumann (Lippa) to help and overlook the building of houses until 1765 The population suffered a great deal from floods and fever but in the spring of 1766 the Vienna Bank gave the order to build a new and larger colonist community. Hildebrand took it upon himself to be in charge of this one. He chose the formerly swampy low lands of Esombol, Rabi and Peterda. He submitted his idea, building plans etc to Vienna and recieved permission to proceed. On the first of March the necessary building materials were beginning to be shipped for building by families that were not permantly settled yet. In 1763 Queen Maria Theresa had released a new and improved settlement agreement which guarenteed settlers much greater advantages (profits) She also hired advertising agents in the Rhine area to entice people to come. The agents in Meinz and Trier were especially efficiant and hired carefully selected men to go to the regions small towns and outlying areas to recruit families. They had to be Catholic, hard working and productive, not the vagrant type. Most sucessful in the recruitment was Pastor Sebastian Plenkner from Sien. He convinced his followers to immigrate together and establish a new community in the Banat called Landestreu (faithful to the country) and had to be applied for in Vienna. His permission was granted and he also needed permission to preach in the new settlement which was granted on March 15th 1766. The agricultural workers and newly recruited couldn't just up and leave as they had to give notice to their employers, get release papers etc. So on Georgi day 1766, the people met in Mainz and Trier, full of hope and enthusiasm with only a little baggage and small wagons they walked the long journey to the Danube river where ships were waiting to take them to Vienna. Why the Sauerland Farmers went to Banat-Click Here! Most Hatzfelder spoke Moselfraenkisch mixed with a little Sauerisch and Lothringerish. The French spoken by the people from Luxembourg and Lothringen was so far from the French language as Schwobish was from German. When the settlers were recruited they had to show proof they had at least 100 Gulden in cash. From Georgi Day on they recieved per diem and travel money. In the old country they aquired agricultural knowledge and dilligence. When the journey started of there was alot of good fun, bragging and mockery which later was the cause of arguments. The 18 men that did the recruiting did not want to obey the strict rules of the preist, whose followers they called Landstreicher (hobos) instead of Landestreuer (faithful countrymen). The arguments went on day after day and teasing turned into hostility. Part of the group decided to give their part of the community a different name. The intention was followed through during a 3 day layover in Vienna. A letter was sent to Graf Karl Friedrich von Hatzfeld (1718-1793) requesting the use of his name for the village which was granted. The settlers left Vienna by boats on the 7th of May and after crossing the Hungarian border the rains came and followed with the settlers southwards. In Pancsova they were quarentined due to an ongoing epidemic and in an act of grace it was shortened from 6 to 4 weeks. But the sky had no mercy on the future farmers and it rained every day until the 3rd of June followed by a 3 day down pour never seen by the Germans before. The skys cleared on the 6th of June and then the sun scoarched with African intensity, (the sky not clouding over even one day until November). In May the Bishop asked all to pray for sun, in Oktober he changed it to rain. This was Banat weather! Each day the settlers became more discouraged. Coming around Bacska and still on the ship, they couldn't see shore in any direction, yet they knew large colonies had been sttled there not long ago. What happened to them? The Apitner Hotter (this region) was all water with no border. Many people became deathly ill from discouragement and the water supply. The morale was so low during the rainy period that half the settlers were ready to go back. Plenker told them how embarrassing it would be to return home after 7 weeks and 215 miles with nothing to show for it all. And they were only 2 days from the final destination they had dreamed of for so long. When the final march started on the 9th of June only 43 families stayed behind on the ship to return to their homeland. On the 11th of June 1766 the settlers arrived in the settlement area. The condition of the area was horrific. In Vienna they were told they could expect to find almost totally completed houses, ready to move into and crops already growing in the fields. Instead the houses were hardly started and the village nothing but puddles. The work crew was camped on the hill. In just over the month the work crew was there 178 of them had already died. They could not be buried due to the water table so they were covered with ground 2 feet high. 178 mounds. The first summer crop had been planted but could be seen because of the weeds. Finishing the houses went fast as all the settlers pitched in and helped and a church was soonafter built and finished in Oktober. The happy occaision was tarnished however as the swamp fever had struck the area. By December of 1766 a total of 215 of the new arrivals had died and been put to rest in the new homeland. The following winter was extremely harsh and wolves had to be fought off on many occasions. For the next year there was endless scandals, accusations, lawsuits, arrests and improper conduct. In September 1767 Plenkner returned home to germany after being relieved of duties and left behind a list of IOU's and burial expenses in the amount of 2000 Gulden. After a better harvest in 1768 peoples moods became better and little by little the farmers became wealthier. The ones they called hobos renounced the name of their village and on September 14th the 2 villages were united. The following January a new priest by the name of Karol Josef Bretterreich was appointed. In 1770 flooding came again along with the swamp fever and another 553 people died over a two year period. 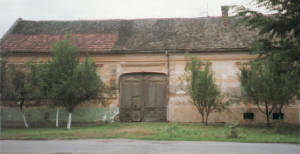 In 1778 Banat was united with Hungary. Since the train there has been alot of progress in technology. The candle replaced the old fashioned grease light and the fast growth of the economy were due to the women. Before the days of the train there were over 1000 spinning wheels, today its more likely to find 100 pianos rather than 100 spinning wheels. The Hatzfelder has always liked to travel and now days its much faster. Right after the war you could go by Zeppelin to Budapest in 2 hours, Vienna in 4 and Luxembourg in 10. Now small airplanes visit the village. Looking back there were happy and sad times, as will be in the future. May only the best come true! At the Worlds Fair in Leipzig in 1914, I was astonished to find a map with Hatzfeld on it. 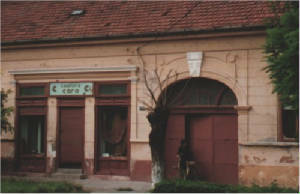 In large letters it read "Hatzfeld, Pearl of the Banat"! And this was written by strangers! Then I remembered Hatzfeld had such an interesting past. Wonderful families settled there and always mixed with newcommers. We would love to know you have visited the Hatzfeld page. Please sign our guestbook below! This web page is part of the Kraushaar family history and genealogy project. The Kraushaar family immigrated from the small village of Deutmecke, near Schoenholthausen in the Sauerland region of Westfalia, Germany. They arrived in Hatzfeld at various times between 1766 and 1799. For further Duetmecke-Schoenholthausen information and genealogy information on the Kraushaar family go to www.kraushaar.us (it can also be viewed at http://kbfdradio.tripod.com/kraushaar) At this site you'll be able to trace the family back into Germany from Hatzfeld all the way back to the year 1330. Below you'll find links to Hatzfeld (Jimbolia) photos old and new. You'll also find links to many other Banat and Donau-Schwabish websites. At www.kraushaar.us you can also contact the webmaster Peter Kraushaar who is a genealogy and history researcher and sign the Kraushaar page guest book. He is happy to communicate with anyone interested in Hatzfeld or Kraushaar history! On the www.kraushaar.us guestbook, please feel free to share any Kraushaar history you know about! If you are a Kraushaar, Kraushar, Cruishair or Cruishaar please visit the Links page also at www.kraushaar.us where you'll find links to Kraushaar's the world over. Some famous and some not so famous. I'd be happy to add a link to your page too! I call this page "All things Kraushaar"! Here are the edited diary entries that my Dad Joseph Peter Kraushaar made during his extended 4 month stay in Hatzfeld in the summer of 1938. Just click the link below to read them! 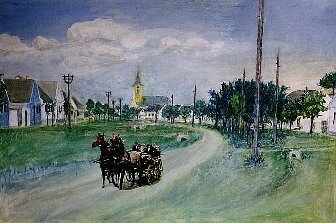 In Hatzfeld much of the daily family life was centered around the church from the late 1700's until the early-mid 1900's.